Meal Planning for BeginnersMeal Planning can save you thousands of dollars in grocery bills! Meal Planning is a terrific way to save thousands of dollars per year on your grocery bill. It’s a fact of life that we have have to eat, three meals per day in fact. For some, it’s a matter of deciding on the day what is going to be dished up for dinner, and others have a bit more of a plan. Meal Planning is great way to save time and money in the kitchen. A lot of people are scared of meal planning, or feel it’s too much like hard work, but it’s all about being organised. How would you love to know that you have the whole month’s or fortnight’s worth of meals already organised? And the best thing about Meal Planning is that it saves you money, which we are all about here at Stay at Home Mum. In fact, once you have it down pat, you can save THOUSANDS OF DOLLARS per year! Now isn’t that worth a few hours of your time per month? If you’re tired and cranky at the end of the day, it is then that you can fall into the trap of getting take out. There goes your budget and if you’re watching your weight or eating for health, well that’s gone too. So with a little preparation (and help from SAHM!) we can help you with easy to prepare, quick and healthy meals at home. Let’s get started! Here are some great tips to get you in the mood for cooking! A dirty or messy kitchen is not inviting to cook in. And a well organised and squeaky clean kitchen is a total joy to work in. Take the time to clean, organise and sort your kitchen into a cooking haven. Organising also helps you know what you have, what you need, and what needs throwing out! Invest in some good quality containers to store your dry foods and protect them from moths and weavils. Not only do they protect your food, they look great too! Take stock at your cookware. This includes your saucepans, slow cookers, electric fry pans, pressure cookers etc. Sort your pantry – really sort it! Put the items closest to their used-by date at the front – and write a list of things that need to be used right away. Remember that throwing out food is like throwing away money! Enlist the help of hubby or the kids to give you a hand and make sure they clear their own dishes and pull their weight. Always keep your sink clean and shiny – a clean and shiny sink always makes you feel like your kitchen is clean! Sit down with pen and paper or use Excel on your computer to write a list of meals for the next week/fortnight or month. Think about meals that your family like to eat. Write your family favourites, see what needs using up in the fridge and pantry that is close to it’s best before date. 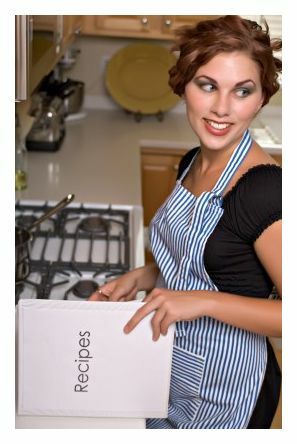 Check out the SAHM website for lots of frugal meal ideas, and pull out all your old cookbooks. Anything that will inspire you. Remember to shake it up a bit and choose different meats or even some vegetarian style meals. Write a separate list of your favourite meals and place it on the fridge so you are inspired for next time! Don’t restrict your list too much by saying thing like Lasagna on Monday and Barbecue Ribs on Tuesday etc. That’s too hard! Instead list your meals into the different meat or vegetarian categories; that way if you’re too tired that night you can choose something from the list that is easy. For example if you decide you want mince tonight, Spaghetti or Shepherds Pie is much easier to cook than Lasagna! This is about making your life easier, not harder! There is nothing worse than coming home exhausted from a great big shop and realise you have no room in your fridge. So before shopping, make sure you clear out the dregs. See what can be made into another meal or what was forgotten and needs throwing out. Check out your freezer and make sure you have used meats purchased and stored earlier rather than buying new meat and storing that on top. So you have compiled your list and off you go. But hey, they have chicken mince on sale for $2.50/grams – what a steal!!! Seize the opportunity and buy awesome specials. Pop them in your freezer when you get home. It’s good to add some flexibility into your shopping list to allow for bonus meals. Be flexible. If you get to the grocery store and they have some thing unbelievable on sale then adapt your menus to save money on groceries. Always know what’s for dinner the next night – why you ask? You can take that meat out of the freezer and start defrosting it in the fridge. If you have the meat ready to go there is no excuse! Even better try Freezer Cooking and have it all cooked ready to go! Do a quick stock take the night before too and make sure you have all the ingredients on hand. Just in case hubby or the kids have used that last onion or tomato that you might need. What can you do today to make your life easier tomorrow? Spend ten minutes every night preparing for tomorrow. Whether its making sure there is enough bread for sandwiches in the morning (or even make them and put them in the fridge), cutting up carrot sticks or making a jelly for tomorrow night’s dessert. Don’t spend much time on this, but a little thought will go a long way. If you decide to have Shepherd’s Pie tonight and you have lots of left over mince, consider adding some tomatoes or a can of tomato soup and have Spaghetti the next night. Or if you make a Roast Pork tonight, save enough leftovers to have Fried Rice tomorrow. Do you meal plan? Maybe it’s time to give it a go! Download some of our FREE Freezer Cooking Printables – HERE!